Notes: There is a spinoff manga of the same name by Ikeda Taeko, but in this case the anime came first. The writer has, in fact, seen up to episode 16, but on such poor quality source material that he is reluctant to comment on anything past the initial episodes. Klutzy schoolgirl Kokubu Karin helps an injured pig one day while on her way to school. Only, it's not injured at all, just hungry. And, well, he's actually a flying space pig named Tonrariaano. And for her kindness, Karin receives a magical compact that allows her to change into the beautiful, magical heroine Boorin! Which would be cool, except that Boorin also happens to be a flying space pig. What's a magical girl to do? Well, as many good deeds as possible until she can be a real magical girl! 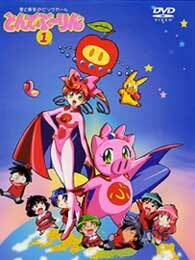 It's been a while since I've seen this, but this is a show that's fairly easy to remember, unless cute, pink flying space pigs aren't considered memorable. Unlike the other pig show that's been reviewed here, Tonde Boorin is relentlessly cute and adorable, once you get past the rather dumb first episode. While it is not what you would call serious by any means (duh!) this show features a likable heroine, a lot of simplistic (but usually effective) humor, and a truckload of cute. On one hand, I can't say it's for everyone. Many adult viewers (and probably even more teenagers) would probably wonder why you'd even bother with this material. The relationships and the schooltime aspect of this show are very, very rudimentary -- there is nothing complex to be found here. Karin and her friends are definitely kids and that is the audience toward which this is aimed. It's a hair more sophisticated than Hamtaro, but it's certainly a good deal lighter than Marmalade Boy, and if that series is too light for you, then I can't imagine you'd enjoy Tonde Boorin. On the other hand, it's great fun for younger audiences. While the animation is quite simple (one might say perfunctory), it's very colorful, with a bright style that lends itself well to what is essentially a children's comedy. The music is almost excessively cute, and the whole production makes you wonder how the voice cast got through this without having to stop every five minutes for a laugh break. While none of the humor is particularly highbrow, it isn't meant to be -- this is made to appeal to elementary and middle schoolchildren, not twentysomething anime reviewers. It should tell you something when this twentysomething anime reviewer found Tonde Boorin to be a lot of fun. So, why, again, was Tokyo Pig licensed instead of this? I'm beginning to think that someone at Buena Vista screwed up. Recommended Audience: At its very worst, Tonde Boorin features mild peril and slapstick. It should be fine for toddlers and up.